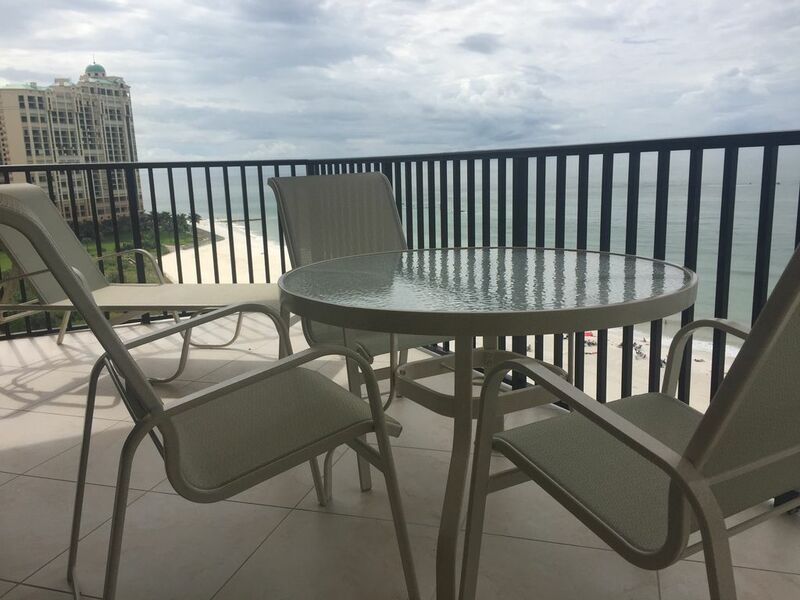 The SEA WINDS of MARCO, a beautiful gulf-front condo, located on the quiet south end of the island offers a totally unobstructed, breathtaking view of the Gulf of Mexico. This is a LARGE, two bedroom, FULL two bath condo, ideal for couples, families, or 'snow birds.' Most other Sea Winds units are smaller, with only 1.5 baths sharing a common shower. You will enjoy beautiful sunsets and watch dolphins right from the balcony. A large heated pool, hot tub, and tennis courts are on the property for your enjoyment. This tropical island off the southwest coast of Florida offers 3.5 miles of renowned beach. Enjoy fishing, boating, shelling, golf, tennis, fine restaurants, and shops - or simply relax and enjoy the sun. One of only 4 beachfront condos on Marco Island that allow seven day rentals. This property is not appointed like a rental. Everything is plush, comfortable, and perfect for a family or couples vacation. The people in the complex are friendly. The gated building, pool, and beach access provide safety, and the restaurant next door is awesome! For some reason it’s not a Yelp favorite like all the other expensive restaurants that in my opinion are all the same—not great. That means you can conveniently pop in at any time for a meal, drink, or take out. So convenient. The property owner is easy to work with and they provide everything you could possibly need for the beach! Tons of chairs, towels, umbrella, cooler, etc. The sunsets and dolphin watching from the balcony were so beautiful that we started going out to lunch and making dinner in so we didn’t miss a one! Thank you Bob, for providing our family with just the relaxing vacation spot that we needed. It was perfect, and if it’s available next year you can bet we will be here! We loved the location for watching the beautiful sunsets from our 14th floor balcony! And we enjoyed several dolphins jumping out front too! We would stay here again! Great location, condo was everything advertised and more, owner was incredibly responsive. I HIGHLY reccomend! We will be back! Clean and comfortable with an awesome view. The unit was very nice and clean. The view was fantastic and are stay was very enjoyable. Would stay here again when in Marco. Well maintained, close to beach, great beach view from balcony, walk to restaurants, safe area--all add up to a perfect vacation. Thanks! The view was amazing. Loved everything about the condo. It was very modern and clean. The kitchen was fully stocked with everything we needed. There were plenty of towels for the week. We really liked that beach towels and beach accessories were provided as well. With laundry facilities in the condo, we were able to clean our clothes before we left and put them away when we got home, not having to worry about doing laundry first. Oh, and the view was amazing.